We are proud to announce that our flagship solution for Office 365 email signature management – CodeTwo Email Signatures for Office 365 – has just received the Gold Award from MSExchange.org (TechGenix), a recognized portal providing high-quality content for IT professionals. The program has been reviewed by Nuno Mota – a Microsoft Most Valuable Professional in the area of Office Servers and Services. CodeTwo seems to tick all the boxes. (…) emails are processed by CodeTwo servers within the same Microsoft datacenter as our Office 365 tenant. Then, everything is TLS-encrypted, and CodeTwo does not store any emails or credentials. He also concluded: CodeTwo Email Signatures for Office 365 is one of the best email signature solutions I have seen and makes the whole process straightforward. We are truly honored to receive this high 4-star rating and we are more than pleased to hear Nuno Mota’s words of recognition. This award showcases our expertise in developing applications recognized for their solidity, reliability, and usability. CodeTwo Email Signature for Office 365 is our youngest program but it was developed with a strong foundation of 10-year experience in software engineering. And this acknowledgment confirms that we deliver trusted and valued solutions for Microsoft platforms. CodeTwo Email Signatures for Office 365 is a solution that helps IT administrators fight back against email signature management problems. It not only assists in creating professional email signatures that help develop and improve a corporate image to the outside world but also takes care of a more technical aspect of signature management by responding to high-security standards to protect your company Office 365 emails. We can ensure you that gaining this accreditation will not make us rest on our laurels but motivate us to work even harder to provide reliable, secure and intuitive solutions that make every admin’s life easier. And of course, we would like to hear your opinion about our programs as it helps us constantly improve our solutions and make sure we walk down the right path to address your business needs. 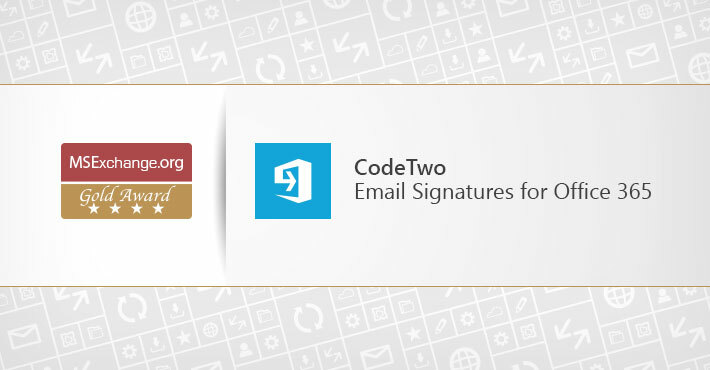 A complete review of CodeTwo Email Signatures for Office 365 can be found here.